The Boston Jewish Music Festival’s showcase evening this Saturday at Berklee Performance Center is called “A Celebration and Concert,” and Theodore Bikel, who’ll turn 90 in May, has plenty to celebrate. 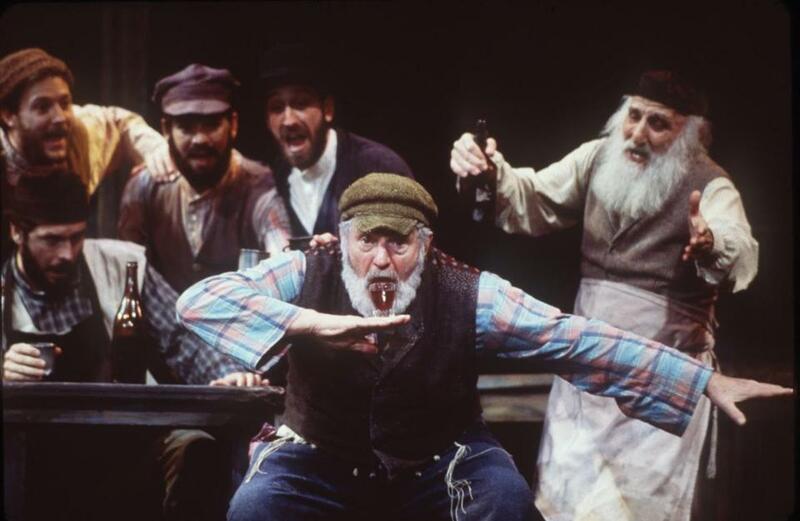 He may be best known for playing Tevye in “Fiddler on the Roof,” but he’s been an author, a folk singer, a political activist, a film, theater, and television actor, and the president of Actors’ Equity. He’s been the face of Jewish folk and Russian gypsy music. 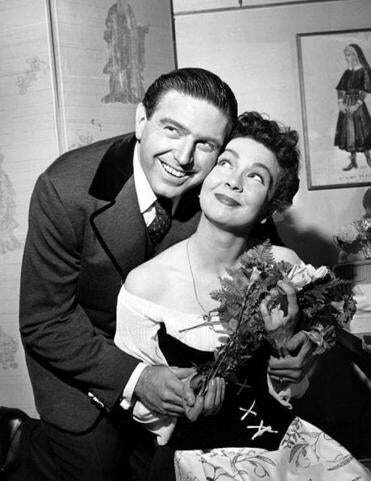 He originated the role of Captain von Trapp in the Broadway production of “The Sound of Music.” His first film role was in “The African Queen”; later he played the Hungarian dialect expert in the film version of “My Fair Lady,” and he received an Oscar nomination for his role as the sheriff who chases Sidney Poitier and Tony Curtis in “The Defiant Ones.” And he’s been on every kind of TV show: “The Twilight Zone,” “Gunsmoke,” “Dynasty,” Charlie’s Angels,” “All in the Family,” “Murder, She Wrote,” “L.A. Law,” and, playing Worf’s adoptive father, “Star Trek: The Next Generation.” Here’s some of what he had to say on the eve of his first Boston appearance in years. Q. Did you start out as a singer as well as an actor? A. I started out as an actor, but I always sang on the side. Then when I came to America, they discovered I had that musical side to me. And America, as you know, is a country that will not tolerate your doing anything well without forcing you to accept money for it. Q. At what point after coming to America, in 1954, did you become a professional singer? A. I was playing and singing at parties, and Jac Holzman heard me. He had a small label called Elektra Records, and he said, “I don’t know how much of what you do is visual, because you are a very powerful personality. So what I want you to do is record a few songs, and I’m going to play them for some people who’ve never met you and see what kind of impact that can make.” So he played it for people who had never heard of me, and the next thing I knew I had a recording contract. Q. People think of you as Russian, and yet you were born in Vienna. Do you have a Slavic family background? A. My parents came from an area in Eastern Europe that changed hands a lot. When they were born, it was Greater Austria, but that same place is now Ukraine. They spoke Yiddish, and sometimes Ukrainian. Q. Did you think of yourself as a protest singer in the 1950s? A. I thought of myself as a political activist, and that included songs. Q. Were you a protest singer for Russian Jews? A. When it came to Russian Jewry we were really locked behind gates, figuratively. Yes, those were protest songs. But I was a singer of other songs simply for the joy of it. Q. You founded the Newport Folk Festival with Pete Seeger, among others. Can you talk about that? A. This was a time when there was a great upswing in interest in folk music. For the first time in recorded history, the sale of guitars exceeded the sale of pianos. And when you consider that you have to sell about 40 guitars to make up for the cost of one piano, that tells you something. We thought that there needed to be a place and a time, once a year at least, where all this could come together. And also because we owed a debt to the people from whom we had learned. So we decided to create a festival, and to plow all the proceeds back into the field. To buy instruments for people who couldn’t afford them. To buy tape recorders for folklorists to come and collect the music. To create smaller regional festivals. We made a great deal of money at Newport, and none of the artists got more than $54 a day to appear. And that included Joan Baez and Bob Dylan. Whatever money was made was then dedicated to what I’ve just described to you, seeing that the heritage is being preserved. Q. Did you stay in contact with Pete Seeger? Q. You’ve characterized the Tevye of “Fiddler” as “Tevye light.” Talk about your own Sholem Aleichem show, in which you play a different Tevye. A. “Fiddler,” of course, is a Broadway musical. And musical theater used to be called musical comedy. It had to be light, by definition. The element that is kind of overlooked is that a Jewish light is not really very light. There’s always a tear in the midst of laughter. Always a smile in the midst of suffering. And it has to be a proper mixture of the two. “Fiddler” is heavy on the laughter and light on the suffering. When I created my one-man show, “Sholem Aleichem: Laughter Through Tears,” I wanted to emphasize both. And now I’ve made a film that will be out in a few months called “Theodore Bikel: In the Shoes of Sholem Aleichem,” which does the same. Q. You lambasted Vanessa Redgrave for her support of the 1977 film “The Palestinian,” but you’ve also criticized Israeli proposals to uproot Bedouins from the Negev Desert. A. I am deeply disturbed by what I perceive to be a path that Israel is on that is flawed. Israel turned itself from a society that I loved and adored, a socialist kibbutz-oriented society, into a consumerist society imitative of American qualities, and not even the best of our qualities that we have in this country. And I cannot bear the thought of Israel as an occupier of other people’s lands. I love Israel enough to want to say, write, and sing things to remind her of how she started and not to forget the dream. If I’m critical of Israel, it’s because I love Israel more, not less. I have the same attitude toward the United States, by the way. 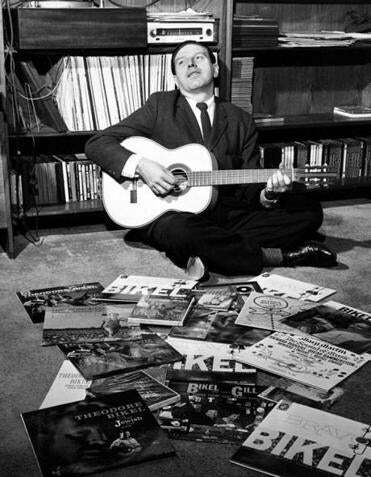 Theodore Bikel strummed his guitar on the floor of his Greenwich Village apartment in New York City, 1959. Q. Has protest music gone out of fashion? A. Well, those of us who still sing the songs of Phil Ochs don’t believe it’s gone out of fashion. Obviously nothing new is being written. Q. How did this Boston Jewish Music Festival concert come about? A. They gave me a phone call and said, “Would you appear?” And I said yes. Q. What kind of show will you bring to the Berklee Performance Center? A. It’s kind of eclectic and in conjunction with people of the Klezmatics, Josh Dolgin from Canada, and my wonderful wonderful accordionist, Merima Kljuco. And it’s going to be Yiddish music predominantly but not only.